Materials needed: Paper lunch bags, glitter, glue, crayons or markers, Halloween stickers, battery operated tea lights, and sand (rice, beans) for the bottom of the bag. 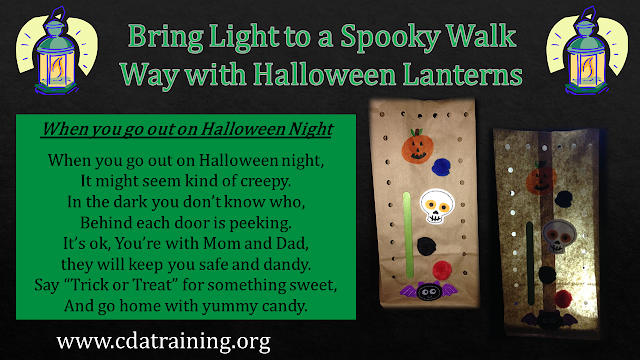 Instructions: Decorate the lunch bags with glitter, glue and markers or crayons and or Halloween (Or Harvest) stickers. Leaving the paper lunch bag flat let the children punch as many holes as they like. (If the flat bag is too thick open it, but the hole-punch will only reach so far.) Open the bag and pour at least 1 cup of filler per bag (see above). Place the battery operated tea light inside. Set outside or inside for a safe shadowy glow.